In a town that owes its place on the tourist map to some of the most spectacular spiritual monuments in history, it’s only fitting that you can still find a quiet retreat to feed your own 21st century spiritual needs. And at Peace Cafe, you can also re-fuel with some quality vegetarian food at the same time, in one of the greenest, coolest parts of town. Bright pink balustrades tell you you’ve arrived, and relief is at hand. In late 2015, Peace Cafe moved from its original home to the leafy environs of the East Riverside, north of Route 6. 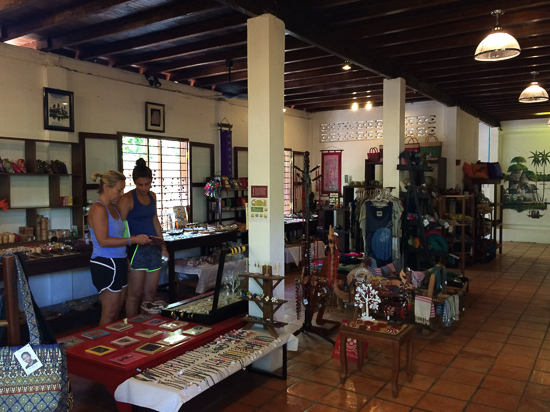 It’s a five-minute tuk tuk ride out of town, but the relief it offers from the heat and unrelenting urbanism of central Siem Reap makes it more than worth the trip, and that’s before we get to the enormous menu, socially conscious shop and busy social programme. Smile, you can be naughty and nice all at the same time. 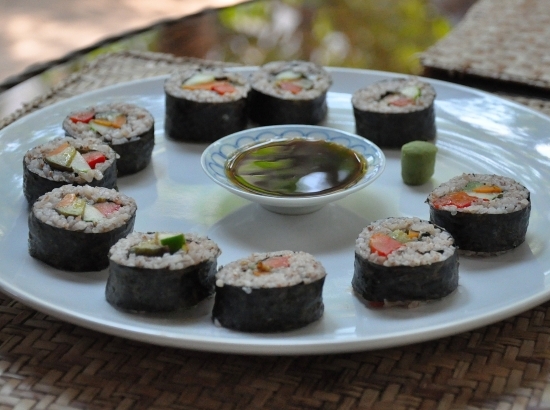 As well as offering some of Siem Reap’s tastiest vegetarian fare — such as sushi, burgers and vegetarian takes on various Khmer classics — Peace Cafe has also has an extensive list of vegetable and fruit juices. This is also one of the few places in town that will not fleece you for a bowl of muesli in the morning. Their long breakfast menu includes scrambled tofu, crepes, soups and more. Surprisingly, for somewhere so virtuous, the coffee is really good (perhaps we’re being a little cynical here). They also have a bakery, and we warn you now: do not look at the cookies if you don’t want to be tempted. They’re delicious. If you fall in love with the vegetarian food served in the cafe then you too can learn to cook Cambodian without harming a single living thing at one of the daily cooking classes – priced at $20 per person, including lunch and a copy of the recipes. Guilt-free shopping. Who could argue with that? 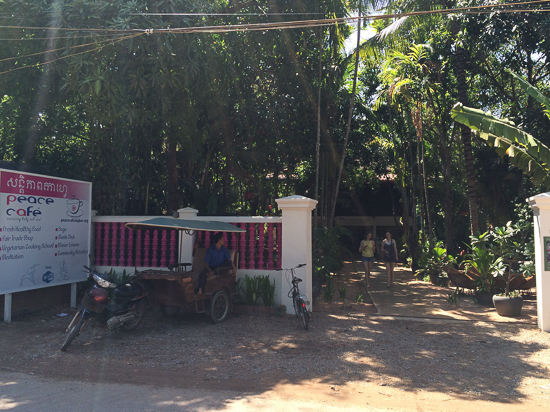 The cafe also has a busy social programme, with yoga classes Monday to Saturday, Khmer lessons and ‘monk chats’ where you can discover some of the basic principles of Buddhism on Saturday and Sunday. The cooking classes take place every day, at 13:00, and you can also book in for individual or group classes on meditation techniques. It’s probably as well to check before you go, as sometimes the schedule is subject to last-minute changes. 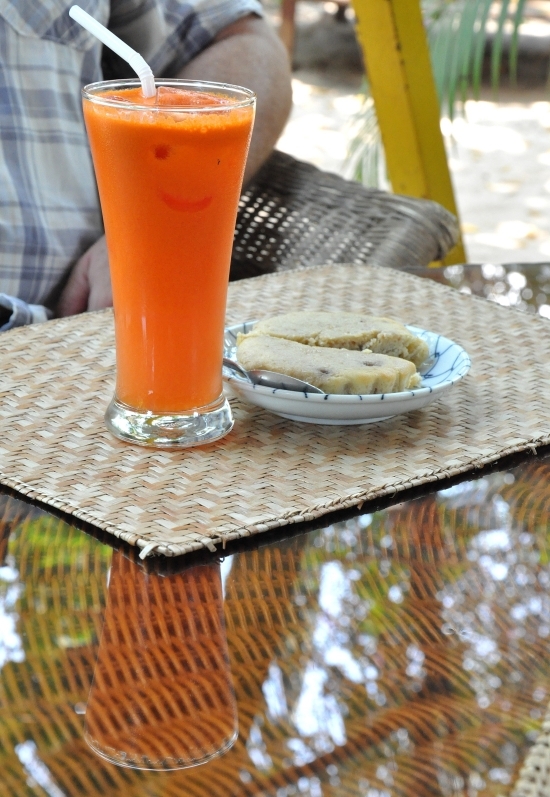 Peace Cafe is a justifiably popular haunt for a broad range of visitors and residents and is worth a visit even if only for a quiet lunch in peaceful surroundings served by friendly and very helpful staff.